Podbean offers so many great features and benefits for podcasters, so you may be thinking of moving your podcast from Spreaker to Podbean. Many podcasters hesitate because they think it could be complicated or costly to migrate their podcast. But, we make it super simple for you to move your Spreaker podcast over to Podbean. And, there’s no cost to migrate unlimited media to Podbean. 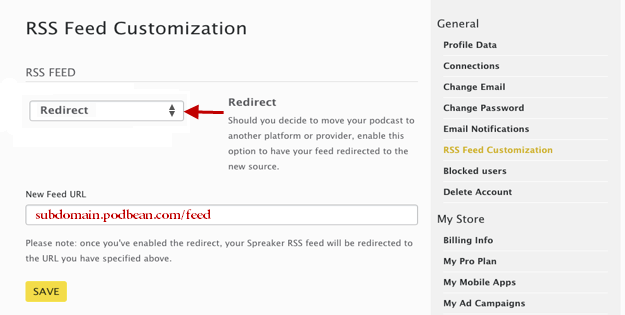 Spreaker will then add the entered iTunes redirect tag to your feed for you. You can log into your iTunes Podcast Connect page and refresh your feed. If not, iTunes will pick up the change within a few days. We recommend keeping your old Spreaker feed in place for a few weeks to ensure all subscribers have moved across.